A strong communal atmosphere spread across the Aviva at this fundraiser for Sean Cox. One where families , partners , loyal Iiverpool and Ireland fans lifted spirits with the Cox family held close to their hearts. Sean was shown in the crowd, and the crowd were shown a pre-recorded appreciation from the Cox family and a thumbs up and thank you from the man himself. 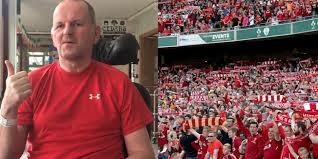 Sean was on his way to a Champions league match in Anfield with his brother Martin when he sustained a serious brain injury. Sean has been in the National rehabilitation centre since. To receive the best treatment available for Sean, the fundraising committee need to make €2million. The best treatment for Sean is either in the UK or Germany and it requires full-time residential care with intensive occupational therapy. Please visit www.supportsean.com to make a donation. A roar of support from the crowd started this game. Players slotting into old positions talking formations. But first a shout out to a former captain of Liverpool Tommy Smith who passed away recently at the age of 74 and then a minutes silence to remember the tragic events at Hillsborough. Robbie Keane tipped off in the green shirt even though he was down as a Liverpool legend on the line up and was first to threaten goal when Stephen Hint whipped in a ball to him for only Sami Hyypia to hide it from Keane. It was Robbie Fowler for Liverpool making the runs, but Lee Carsley was as vigilant as ever. Crosses coming in for Liverpool were being given by Djibril Cisse who was giving Ian Harte a hard time on the left. Harte himself was finding space on the left wing and no doubt waiting for a free-kick coming his way to show his talent. But as soon as Fowler started threatening the Irish goal Robbie Keane turned up his attacking efforts and linked well with Kevin Doyle. On the other wing It was another RTE pundit Keith Andrews, unmistakable with his legendary crop of hair. It was Andrews that put the ball in for the first goal of the evening for Robbie Keane but it was disallowed. Volley expert Ronnie Whelan was substituted in the 17th minute for Graham Kavanagh. Mocking disgust at McCarthy’s decision to take him off so early Whelan threw his jacket at the dugout. At times the game looked like it was that new craze of walking football as Jason ‘Trigger’ MacAteer preferred to conserve his energy over running back into defense. First to score was Ireland with Keith Andrews heading in from an inch perfect cross from Graham Kavanagh. Andrews didn’t stay long on the pitch after his goal as Ireland made 4 substitutions in one go. Andrews making his way for Liam Lawrence but content he got his goal no doubt for bragging rights on the RTE panel. A huge cheer went up for Ireland and Liverpool legend John Aldridge and it sustained until Aldridge seemed almost humble to receive it. Then another huge cheer for Ray Houghton coming on for Ian Harte. A penalty for Liverpool Kenny Cunningham bringing down Cisse in the box. Aldridge deceives Wayne Henderson in the Irish goal to level the score 1-1. Cunningham was now staying close to Cisse, in what looked like revenge for going down in the box. Seconds later Cisse is down clashing with Keith Fahey. Unfortunately for Cisse, he can’t continue and hobbles off to support from the crowd. Confusing times for Robbie Keane in the second half as he changed sides. In his first attempt for Liverpool he blew his chance, when he was free on goal but decided to pass it to a green jersey instead. Goalscorer Andrews is brought back in for Ray Houghton and within seconds tries a chip not far from the half way mark which hits the crossbar. He is the leading contender for man of the match at this stage. With all the swapping of players going on between both sides its hard to keep track and its Liverpool that go ahead with Keane putting Vladimir Smicer through to finish easily. Ireland bring on striker Niall Quinn and the crowd are optimistic about his arrival and not for no reason either as he hits the cross bar with a header in his first attempt on goal. the game ends 2_1 to liverpool.